As Christmas draws near Humpty Dumpty, the conductor of Toyland Express, meets Jack and Jill. They are traveling to Toyland to live with their Uncle Barnaby who does not believe in toys at all. He keeps them up in the attic. Tom Piper's hot air balloon is shot down by Barnaby in an attempt to get rid of him. He wants the chance to shut down the toy factory and is disappointed when he sees that Tom had survived the Goblin Forrest. Jack and Jill try to run away to go see the toy factory which is busy filling an order by none other than Santa Clause. Barnaby finds Jack and Jill and threatens to send them to the Goblin Forrest if they ever go near the toy factory again and locks them back up in the attic. He then hires pirates to sabotage the toy factory so they can not fill Santa's order. Jack and Jill help save the factory before it is ruined by a wrench that is thrown into one of the machines. Barnaby furious that the two interfered with his plans sends them to the Goblin Forrest where the Goblin King Tries to eat them. Tom and his friend Mary rescue Jack and Jill with the help of the pirates. They fend off the goblins with flashlights since they do not like light. They return to the Toy factory only to ruin another of Barnaby's attempts to ruin the toy factory. They are able to complete the order for Santa and as they do Mary and Tom fall in love. The goblins decides to make a reappearance and try and burn down the factory so that Christmas is ruined. They use giant toy soldiers and flashlights to fight them off and the goblins end up chasing Barnaby. When Christmas arrives Santa takes all the toys and give to Jill her Uncle's Cat as a gift. Both Jack and Jill are then adopted by Mary and Tom. 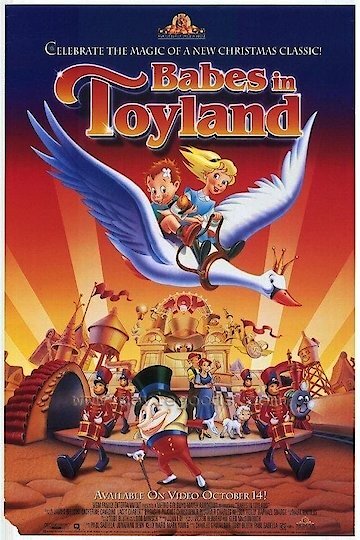 Babes in Toyland is currently available to watch and stream, buy on demand at Amazon, FandangoNow online.